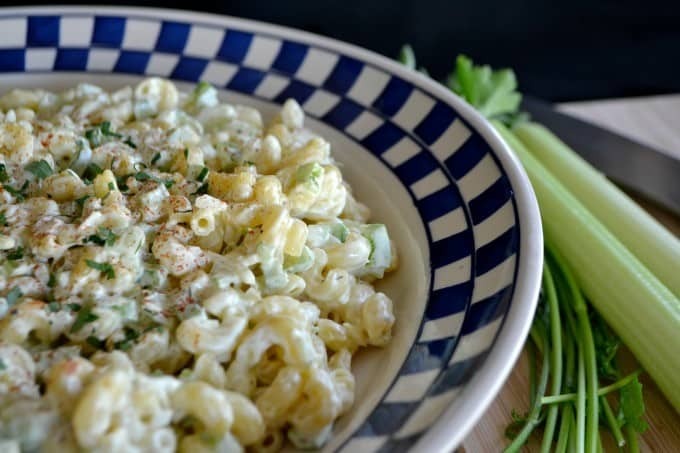 Basic Macaroni Salad – elbow macaroni, green pepper, onion, celery, mayonnaise, yellow mustard, and white vinegar give this dish lots of flavor that is sure to be a hit at your summer BBQ! 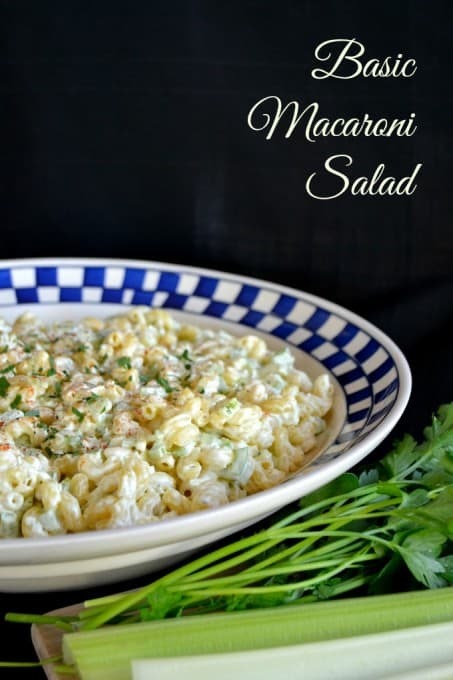 Today I have a Basic Macaroni Salad for you. 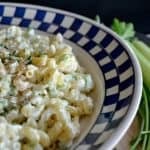 I’ve been making this recipe for years. I got it from my New Doubleday Cookbook, p. 635; authors, Jean Anderson and Elaine Hanna; publisher, Doubleday, a division of Bantam Doubleday Dell Publishing Group, Inc., an imprint of Random House, Inc.; ISBN 0-385-19577-X. Prepare the elbow macaroni according to manufacturer's directions. 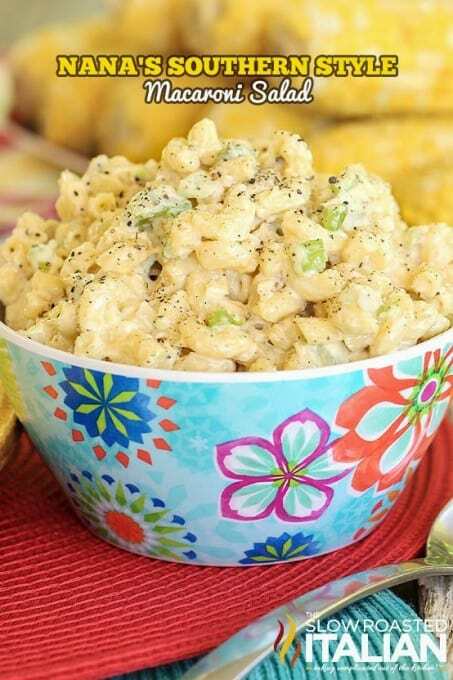 I rate everything I make on a scale of 1 -4 with 4 being the best and this Basic Macaroni Salad earned 4 rolling pins! It’s always a winner whenever I make it and never takes too long to disappear. I also love taking it to pot lucks as well. 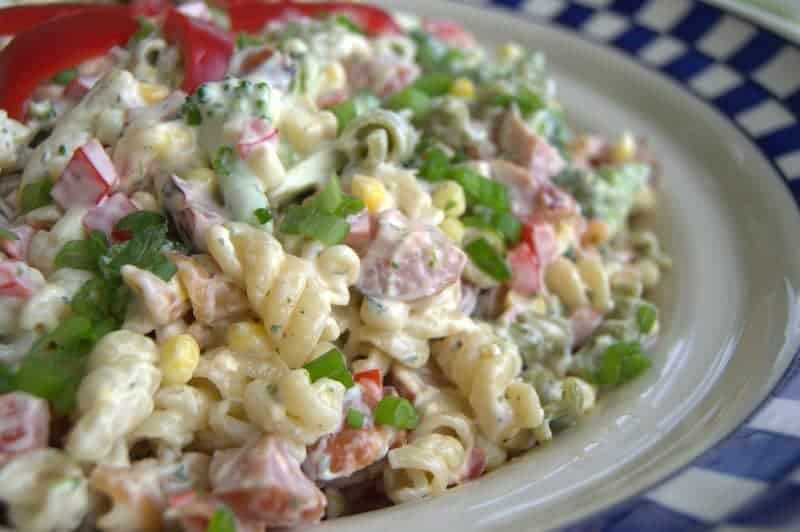 Every gathering needs a macaroni salad, right? This post contains an affiliate link(s). These are links that can take you to a product (or products) that I recommend. I do receive a portion of the sales or credit for my future purchases from any items purchased through those links. Your purchases encourage my baking, cooking and butter habit, and contribute to the life of this blog. I thank you so very much for your support. Let’s keep having fun in the kitchen!! Great idea, Kathie! I’ll have to try that next time. Ooh, I love that idea, Lynn. It sounds SO good! Hope you like the salad! 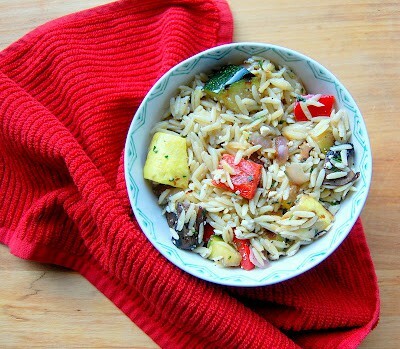 Great recipe, except for the green pepper. It has its place, but not in salads, as I find it overpowering. 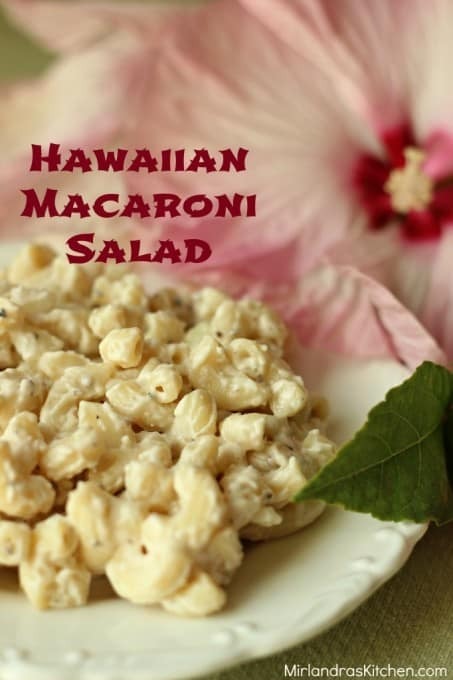 I love them fried with onions, or with veal and peppers, but not in delicate salads. Just my opinion. Not everyone like them, Eileen, you’re right! It can definitely be omitted. 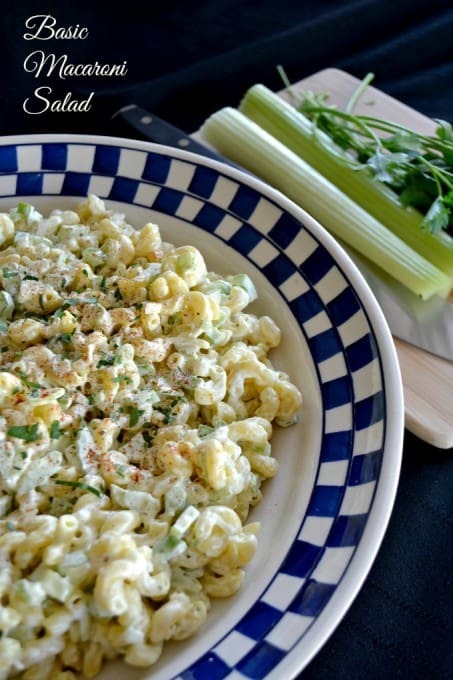 Instead of salt, I added a little sprinkle of celery salt and also a little dill to the salad and left it overnight in the fridge to absorb all the flavors. Tastes so awesome!!! ? That sounds great, Debra! So glad you enjoyed and I appreciate you letting me know. My salad has green onions, multi colored peppers, pickles, pepperoncinis, celery, black olives, water chestnuts, shredded carrots, boiled eggs, frozen peas and jicama. Dressing Miracle whip, mustard, buttermilk, cider vinegar n sugar to taste. That sounds incredible, Deedee. Thanks for sharing! 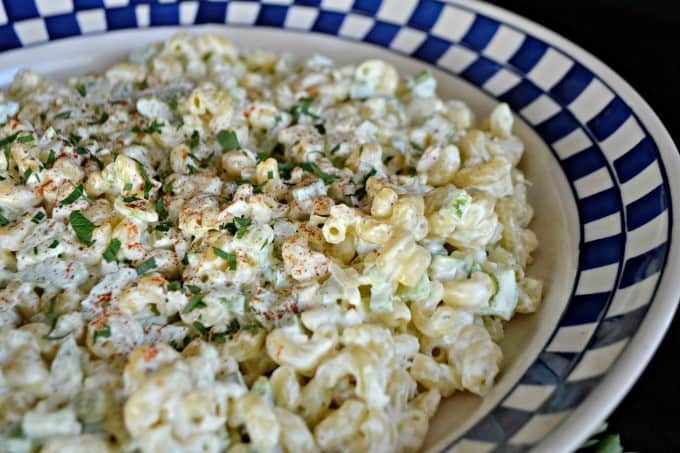 I love the jicama in it, too! 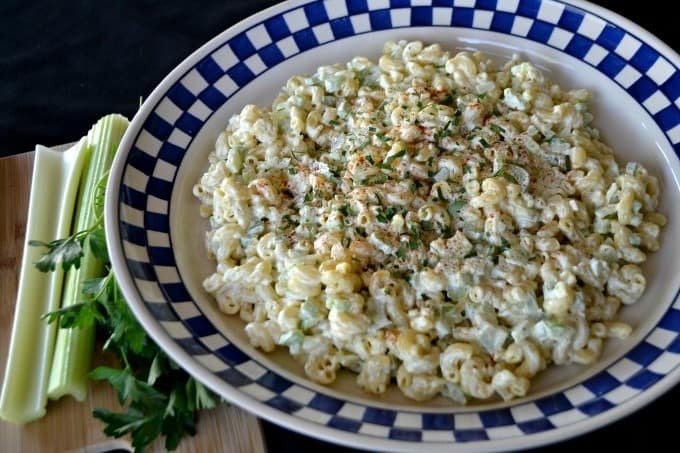 Are the onions in the macaroni salad regular onions or the little green onions? Thanks! Lucy, they are just regular white onions. What is it garnished with? It looks like paprika and parsley maybe? I add tuna, boiled eggs and green olives in mine , it’s really good. Sounds delicious, Sheila! Thanks for the tips! That sounds delicious too, Bethany! I love the addition of the cheese, too.